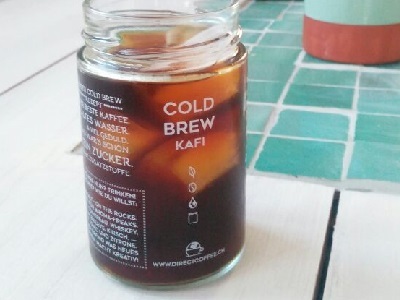 Black cold coffee might sound awful to some of you (and so it does to me), but trust me, cold brew is worth a try. It will make you realize the magic of cold coffee. 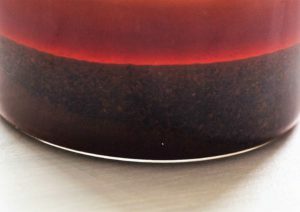 In a nutshell, cold-brewed coffee is ground coffee steeped in cold water for almost a day and then strained. Still doesn’t sound awesome, right? But what comes out is a drink with a smooth caramel like taste, it’s rich in flavor and has an almost sweet finish– even without adding sugar. Good news for all those suffering from sensitive stomachs: the process of cold brewing leaves behind biting acids. That’s why even drinking pure black cold brew is a pleasure. On a hot summer day, served over ice, it is simply delicious. But you can add milk, cream, sugar, vodka, tonic – you name it. The trend was started by a bunch of third wave coffee aficionados like Stumptown Roaster in the US. Today, it’s even available in the Swiss Starbucks. But why should you go to the megacorp if you can simply brew your cold delight at home and store it for the next two weeks in the fridge? Nothing is easier than making your own cold brew. You don’t even need extra material. A pot, a funnel (or a sieve), and a paper towel (or a coffee filter) is enough. Get a high quality coffee that is coarsely ground like our Café Crème ground or take freshly roasted beans and grind them yourself. Don’t grind too fine though, if you don’t want to risk cloudy coffee. Put your coffee in a pot. This may be plastic, ceramic, glass or whatever, it can even be a (clean) bucket if you’re planning to do the cold brew for a party. For around 1 cup of ground coffee, add 7 cups of cold water. You can experiment with the ratio in order to find exactly the taste you are looking for. Cover the pot and wait. And then: Wait again. In total, you should let stand the coffee 16 to 20 hours in room temperature. Take 1) a bottle, 2) a funnel (or a sieve), and 3) a paper towel (or a coffee filter). Strain the coffee through the funnel in the bottle and try to keep the grounds in the pot. Try to keep the coffee grounds in the pot. Repeat, if the coffee looks still a bit cloudy. 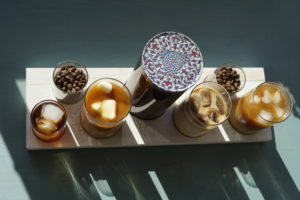 Serve the cold brew over ice. You can add milk, sugar or maple syrup. I’ve even seen people adding Tonic. Or vodka. Well, do whatever you like … and enjoy! Cold brew, cold brew, cold brew.